Musical athletes meet in Tri-Cities for competition KVEW TV The Santa Clara Vanguard Cadets rehearse approximately 25 hours for every 30 seconds of their show. That seems like an immense amount of work to put in for such a short period of time, but in this news report, Kelsey Meder, bass drummer, says, "We're working toward being the best we can be, not only growing as players, but as people as well." Watch this video. Season of Competition Families Online Magazine "Fast forward to today, and the activity has exploded…They are limited only by some pretty creative imaginations," notes Patti Hermes in this article that explores a brief history of drum corps, what they are now and where to find them. Read this article. 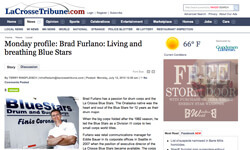 Monday profile: Brad Furlano: Living and breathing Blue Stars LaCrosse Tribune "This was a dream job for me," Brad Furlano says in the article. DCI's record holder for longest tenure as a drum major is the Executive Director of the Blue Stars, and he wouldn't have it any other way. "You should do what you love, and that is what I'm doing," Furlano said. Read this article. Power, precision and passion in performance 9News.com This video feature, a preview of last weekend's Drums Along the Rockies event, features an interview with DCI Hall of Fame member Pete Emmons about the intensity of a drum corps season. Watch this video. Drums and bugles… and love Denver Post Love was in the air in Colorado! Find out which drum major proposed to his girlfriend during the Drums Along the Rockies event. Read this article.